Men are wrongly assumed as the unemotional being. This myth is completely fake and very far from the truth because men are emotional and in even some cases they are more emotional than women. But yes they don’t show their emotions that easy as women do because men think by doing so their masculinity would be hurt. Despite this fact, remains there that men express emotions and even cry when emotionally overloaded. So it’s better to get rid of this myth as soon as possible and envelop a relation of trust and comfort in which your partner can actually express his emotions freely in front of you. Believing that he doesn’t have emotions can actually hurt your relation badly. Another very common and widely shared myth is that men don’t like communicating. Nothing can be so unrealistic then to say that men hesitate to communicate effectively. It is not true to assume this because men sometimes like being silent because it’s not a good idea to be bluntly honest every time. So for the sake of their relationship and for the happiness of their partner, men actually speak a bit less but that doesn’t mean they don’t like communicating. 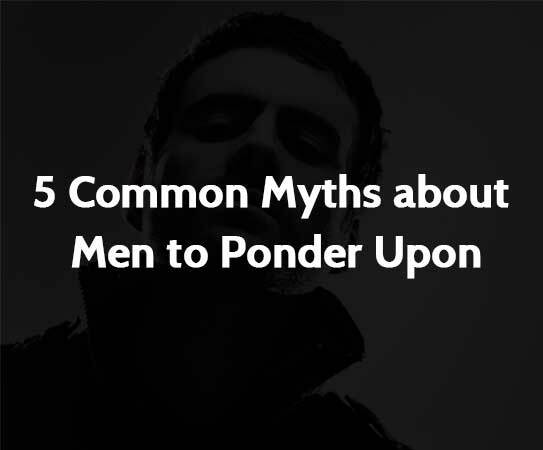 Commitment issues have been always associated with men, but this is nothing more than a popular myth regarding men. Saying men actually run from when it actually comes to make a commitment isn’t true because men have always stood with their partner when needed. So ladies it’s not men run from commitment or taking responsibility rather they wait for the right lady and once they get, they have always shown care and commitment to them. Men are always blamed for being beauty hunter only, meaning they praise and look for physically beauty in women. This is also quite exaggerating statement to give because men though look and get attracted by physical appearances of women, but it’s not only appearance, they look for rather sweet attitude and behavior, are more important for men at times. Down in the list of myths is another common claim made by women is that men never take them seriously nor the criticism done on them. This isn’t right as men not only listen to their partner but try solving every tension of their life partner whom they love.